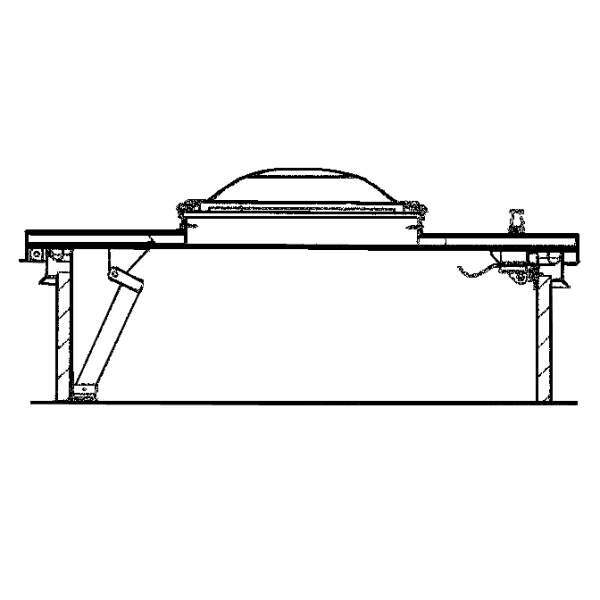 Load/Deflection: Galvanized steel roof hatch covers have been tested and approved to support a minimum live load of 40 lbs./ft.2 with a maximum deflection of 1/150th of the span, maximum negative load of 50 lbs./ft.2 wind uplift, and 110 mph wind load when cover is in an open position. Insulation: The curb includes a 1" fiberboard insulation surrounding the base, and 1" mineral wool insulation between the exterior cover and liner on solid roof area. Construction: 14 gauge galvanized steel with 12" high curb and 3 5/8" wide flange for securing to roof deck. The cover includes a 14 gauge galvanized steel exterior and 22 gauge liner with with a TPE draft seal gasket door seal. Finish: Bonderite®, pre-treated grey hammertone powder coat. Sizes: Up to 48" x 96" (will have multiple domes). Remember the Roof Hatch Safety Rail! Our Patented railing system with a clamping frame around curb base of roof or fire hatch with top rails, mid rails and chain or swinging gate. Meets OSHA required compliance for safe egress and ingress through rooftop hatch openings while hatch is in use. Complies with OSHA CFR 29 -1910.23 and CFR 29 - 1910.27.